Blog of Prof. Gardini, Ph.D.
Portal Prof. Gian Luca Gardini, Ph.D.
Office hours: Please check website in German for updated office hours. Dr. Stolte joined the Chair in September 2014. Previously she was a research fellow at the GIGA-German Institute of Global and Area Studies in Hamburg. 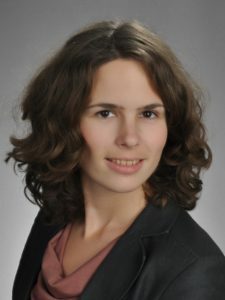 Having studied Political Science and Latin American Studies at the University of Hamburg (2003-2009), she gained a scholarship by the Hamburg International Graduate School for the Study of Regional Powers (HIGS) in 2009 and conducted her PhD project on Brazil’s Africa Strategy at the GIGA Institute for Latin American Studies (ILAS) between 2010 and 2014. Dr. Stolte has worked and published on the international relations of Latin America with a special focus on Brazil. At GIGA she was a member of the research programme “Power, Norms and Governance in International Relations” and of the research team “Foreign Policy Strategies in the Multipolar System”. She worked as desk officer for Brazil at the German Federal Foreign Office in Berlin between 2010 and 2011 and was a visiting fellow at the Brazilian Center of International Relations (CEBRI) in Rio de Janeiro, Brazil between 2013 and 2014. Brasiliens Präsidentin, Dilma Rousseff von der Arbeiterpartei, wurde im Oktober 2014 für vier Jahre im Amt bestätigt. Ihre neue Regierung sieht sich jedoch mit vielen „alten“ Problemen konfrontiert. Im Seminar werden wir daher die aktuelle politische Entwicklung 2015 in Brasilien diskutieren, aber auch und gerade vor dem Hintergrund der strukturellen Schwächen der Wirtschaft Brasiliens, die unter dem Schlagwort custo Brasil zusammengefasst werden, wie (u.a. ):Über-Bürokratisierung bei geringer Effizienz des Öffentlichen Sektors; Korruption und Kriminalität, hohe Steuern und Abgaben sowie relativ hohe Arbeitskosten, hohe Realzinsen, voranschreitende De-Industrialisierung und Verlust an Wettbewerbsfähigkeit. Brazil is the eighth biggest economy in the world and a member of the BRICS group of emerging markets. As the biggest economy in Latin America it has been among the world’s most popular destinations for foreign direct investment. For German companies it has been a major destination for investment, making the South American market one of the biggest outposts of German business in the world. Despite its attractiveness, however, Brazil’s market is considered to be a very complex business environment. In addition, after a decade of growth Brazil has been facing economic problems over the past years and has been struck by the biggest corruption scandal in its history. The seminar will examine Brazil’s economic basis, the business environment and the country’s structural economic problems that keep it from fulfilling its growth potential. Beyond the study of Brazil, the seminar will give insights into the broader topic of emerging markets by drawing comparisons between Brazil and its BRICS peers. One session of the seminar will be dedicated to the practical experience of a local German company (possibly NürnbergMesse) in the Brazilian market. The international system has been moving from a unipolar to an increasingly multipolar system over the past 15 years. The rise of new powers, often summarized under the key word ‘BRICS’ (Brazil, Russia, India, China, South Africa) has been a key element of the fundamental changes the international system has been undergoing. As a member of the BRICS group and a regional power in South America, Brazil has gained considerable clout in international affairs and has had an active role in shaping the emerging multipolar order. The seminar will look at the global power shifts and the rise of new powers in the international system and explore Brazil’s role and position in the newly emerging global order. How has Brazil positioned itself in the international community? What are the foreign policy goals of this rising power? Which instruments does it use to pursue its foreign policy objectives? The seminar is located at the intersection between International Relations Theory, foreign policy analysis and area studies. It will give the student insights into current developments in the international system and the foreign policies of emerging powers – exemplified by the study of the rising power Brazil. Initially conceptualized as an investment label by the US bank Goldman Sachs in 2001, BRICS (Brazil, Russia, India, China, and South Africa) has more and more become a political grouping that is pushing to influence the international agenda. While some scholars see it as an anti-hegemonic bloc that is directed against the dominance of the West and particularly the US, others see it as a mere ‘coalition of interest’ of very different members with different goals and visions. The seminar will examine the international positioning of this emerging powers club and ask about the strengths and weaknesses of the BRICS. What do the member countries have in common? Where do they differ? Is BRICS a coherent grouping at all? How does BRICS want to shape the new world order? What economic policies do the BRICS countries pursue and which economic problems do they face? Brazil is the largest country and biggest economy in Latin America. As a member of the BRICS group and a regional power in South America, Brazil has gained considerable clout in international affairs and has expanded its relations far beyond its Latin American neighborhood. However, economic crisis and political turmoil have compromised Brazil’s regional and international standing. Can Brazil still be considered a rising power? How do neighboring countries and international partners look at Brazil? What are the foreign policy options for a country like Brazil? The seminar will look at Brazil’s regional and international relations. Located at the intersection between International Relations Theory, foreign policy analysis and area studies, the seminar will give the students insights into Brazilian foreign policy making and the country’s positioning in international affairs. Globalisierung bezeichnet die zunehmende internationale Verflechtung von Wirtschaft, Politik Gesellschaft und Kultur. Sie prägt unsere Zeit und nimmt eine wachsende Bedeutung ein, ihre Auswirkungen sind allerdings umstritten. Im Zentrum der Globalisierungskritik steht die Zuspitzung von Ungleichheit und dem Auseinanderdriften von Industrie- und Entwicklungsländern. Gerade die Region Lateinamerika wird häufig als Verlierer der Globalisierung interpretiert. Defizite bei wirtschaftlicher und politischer Anpassung sowie eine fehlendeTechnologieorientierung erschweren es der Region sich in der globalisierten Welt zu behaupten. Vor diesem Hintergrund widmet sich das Seminar folgenden Fragen: Wer sind die Gewinner, wer die Verlierer der Globalisierung? Wo steht Lateinamerika in dieser Einteilung? Wie positionieren sich die unterschiedlichen Länder Lateinamerikas in der zunehmenden Globalisierung? Gibt es gesellschaftliche Gruppen, die gegen eine weitere Vernetzung agieren? In diesem Zusammenhang wird die Rolle Lateinamerikas in der globalen Politik analysiert. Hierzu werden die außenpolitischen Strategien Handelspolitik ausgewählter Lateinamerikanischer Staaten untersucht.